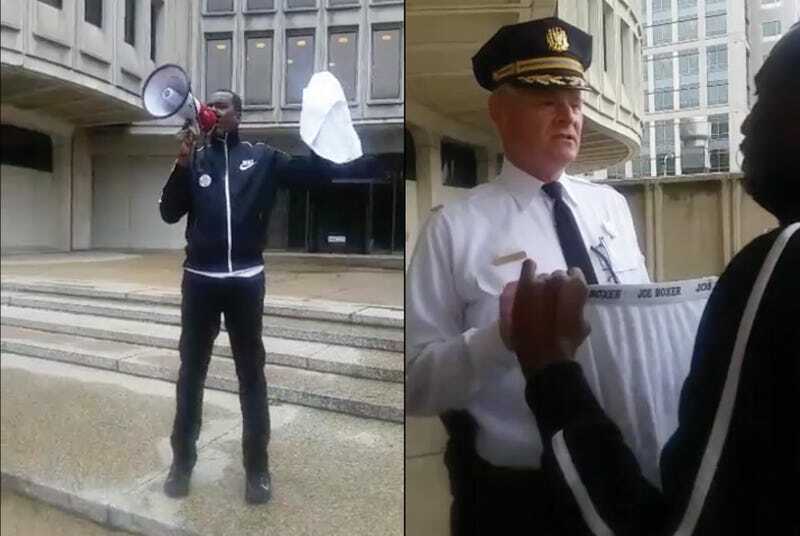 For years, Philadelphia police officers have been illegally stopping black men and searching their underwear. The May 25 story tells of Nafiys Walters, who was pulled over by two white police officers for running a red light as he was going to pick up a suit to wear to his graduation from Cheney University the next day. “They were rough. They … threw me on the ground. It was like damn near being raped. They did what they wanted with me,” Walters recalled. Police searched Walters’ underwear, and reports show that they found marijuana on him, which he denies. Walters spent the night in jail and missed all but 10 minutes of his graduation. The charges against him were later dropped, but the police reports did not indicate that the officers had searched Walters’ underwear. Of course, people will say that this could all have been avoided if Walters had not run a red light, endangering the lives of others in Philly’s heavy traffic, but Walters also denies that the light was red when he went through the intersection. In addition, Nafiys Walters was riding a bicycle. The same thing happened to Monte Singleton, a used-car salesman who was stopped by police after he dropped his daughter off at her grandmother’s home. The police searched his car without permission, throwing his 6-year-old daughter’s clothes on the sidewalk. But the worst part of the illegal search was when the officer patted Singleton down over his clothes, then felt inside his underwear without asking for consent. “They’re out here, basically, going around sexually harassing people. They’re doing what they want,” said Singleton, who filed a complaint after repeated underwear searches. “Certain officers try to be sneaky about it, but then you got some officers who just don’t care … who sees them doing it,” he added. Philadelphia’s police brass, as well as the police union, say they have never heard of underwear searches happening, and the department does not keep a record of underwear searches. Johnson also says that the “stop and fondle” policy continues in part because police officers take advantage of the fragile masculinity among black men.“It’s not a popular sentiment to say, ‘I could not keep another man from going into my underwear or into my drawers,’” he said. The Pennsylvania American Civil Liberties Union has filed an analysis in federal court that shows 77 percent of the people stopped and frisked in the last half of 2016 by Philadelphia police were black or Latino, even though they make up half the city’s population. On May 23, the ACLU supplemented that analysis with data that shows the patterns cannot be explained by neighborhood crime rates or illegal activity. The ACLU reports supplement a 2011 consent decree that ordered Philadelphia police to change its practices. Strip searches—the removal or rearrangement of clothing to permit the visual inspection of someone’s undergarments and private areas—may only be conducted in a police or medical building or other secure facility after a suspect has been arrested, the arresting officer has reasonable suspicion that the individual has a weapon or contraband and the highest-ranking district or unit supervisor authorizes the search in writing, the policy states. Body cavity searches—the actual entering or touching of a person’s private areas to search for weapons, evidence or contraband—can only be conducted in a medical facility by a licensed physician after an individual has been arrested and a warrant outlines the probable cause for the search, the policy states. Read the Philadelphia Daily News report here.